We also saw this concept notebook without identity. Interestingly, it has three external small LCDs to show other stuff such as widgets or programs on your desktop. We were told that this is actually a concept notebook so there is no branding on it. If you recall, there is actually something call the “Windows SideShow” previously in Windows Vista. What you are looking at in the image below is different. First of all, Windows SideShow can utilizes Windows Sidebar but looking at the design here, I don’t think SideBar widgets is the best way to fit in. And oh, by the way, there are 3 external screens in the size of a mobile phone because it is cheaper to buy screens of this size as they are made available for mobile phones. We also got some hands-on time on the MeeGo OS on a MSI Wind (Netbook). 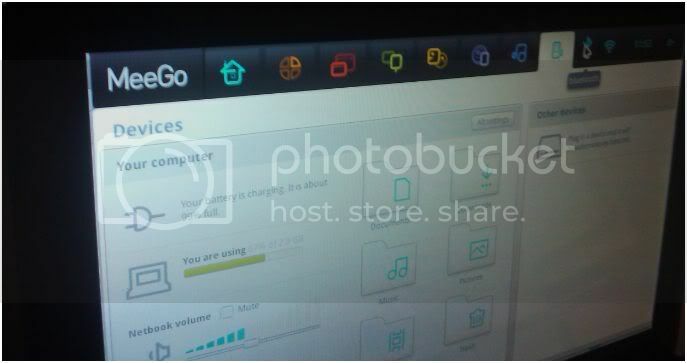 MeeGo is a Linux-based mobile operating system. MeeGo combines Intel’s Moblin and Nokia’s Maemo into a single operating system. 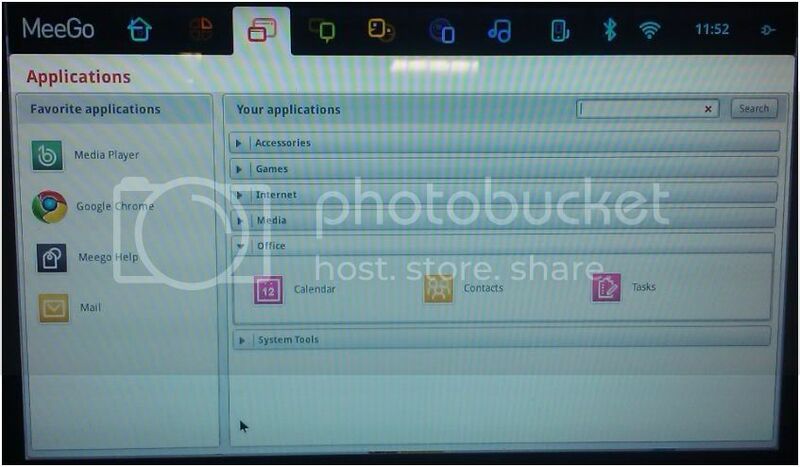 Currently, MeeGo is looking at 5 possible variant; Netbook, Handset, In-Vehicle, Connected TV and Media phone. 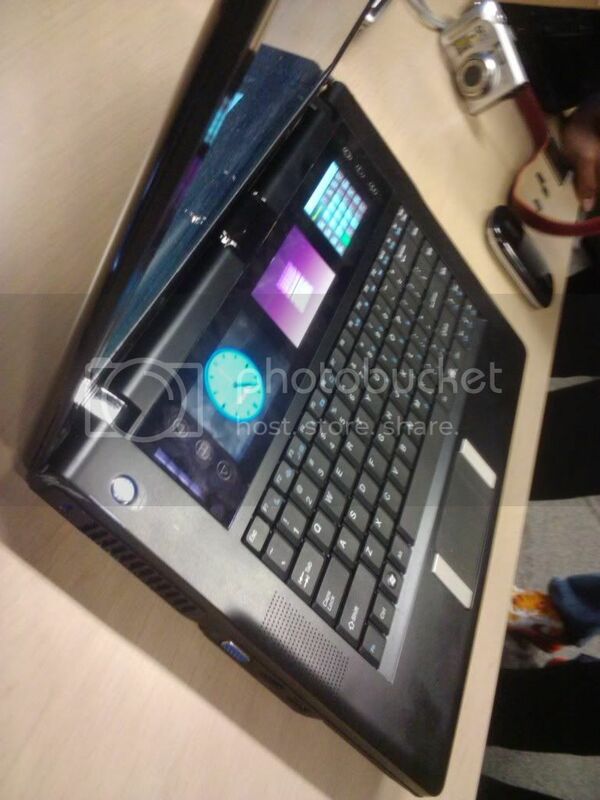 So the variant we looked at is the one for Netbook. Simplicity is at the heart of the design of its interface. There is nothing much to configure and nearly every tool you need to consume media is just right under one of these tabs. We also tried to shut down and boot up the device and it is definitely on the speedy side. For me the question is just how different is MeeGo from a regular Windows operating system, say Windows 7. Obviously MeeGo is made for to make a computing simpler and more efficient but convincing the consumers that this is much easier to use than the all too familiar Windows 7 could potentially been a large hurdle. An informal event that yet gives us a preview of Intel’s technology in the 2nd half of 2010 and beyond. For the highlight is probably the demonstration of Intel Wireless Display. I have seen the demonstration on The Engadget Show and to see it again live and exclusive is awesome! Looking forward to the next one! Pre-Order Apple iPad! and What’s with number ‘4’? acer Xtreme Xchange: Get a new acer!